Few people realise that a plant-based diet not only prevents heart disease but can also reverse it. Choosing whole grains, fruits and vegetables and avoiding simple sugars, and saturated and trans fats, as in meat and dairy products, has been shown to result in regression of coronary atherosclerosis after 1 and 5 years in some studies (1) (2) and to continue for over 12 years in other studies (3). In contrast, standard medical interventions for cardiac patients, such as coronary artery bypass, bypass grafts, atherectomy, angioplasty or stenting, treat only the symptoms, not the disease. It is therefore not surprising that patients who receive these interventions alone often experience progressive disease, graft shutdown, restenosis, more procedures, progressive disability, and ultimately death from disease (4). Caldwell Esselstyn MD persuaded 18 cardiac patients to continue with a plant-based diet for over 12 years. Adherent patients experienced no extension of clinical disease, no coronary events, and no interventions. This finding is all the more compelling when we consider that the original compliant 18 participants experienced 49 coronary events in the 8 years before the study (4). Some patients believe that there is no need to change their diet if they have had heart surgery, stents inserted and/or are taking drugs like statins and aspirin. A recently published international study (5) indicated that individuals (more than 31,000 men and women of an average age of 66 in this study) who chose whole grains, fruits, vegetables, nuts, and fish over meat, eggs and refined carbohydrates had a 35% reduction in cardiac death rates over 5 years. That’s a 35% reduction in addition to the decrease from surgery and optimal medical management. And these men and women were older, where you’d expect diet to be able to reverse less. So it is never too late to make simple changes to your diet and lifestyle to improve your long-term health, whether you have medically-managed heart disease or not. All legumes—beans, peas, and lentils of all varieties. All whole grains and products, bread and pasta, that are made from them—as long as they do not contain added fats. For recipe ideas, tips and information about following a plant-based diet please sign up for my free newsletter and check out my website. You can also find me on Facebook, Twitter and LinkedIn. 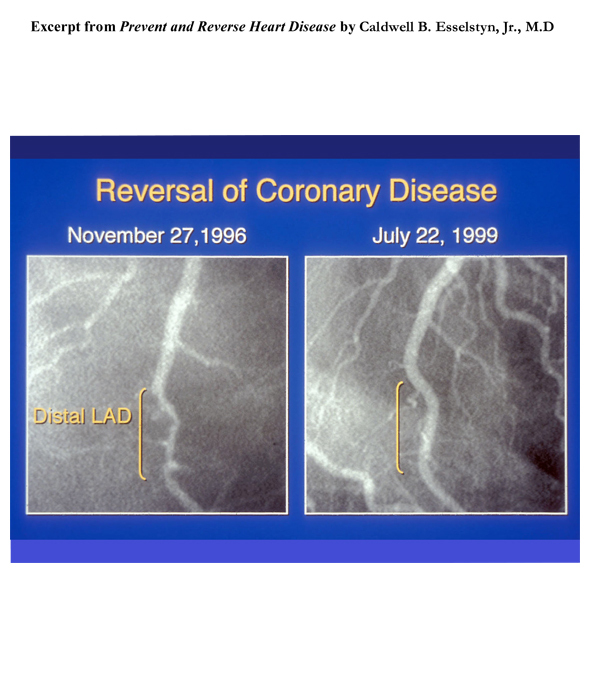 (4) Esselstyn, C. Updating a 12-Year Experience With Arrest and Reversal Therapy for Coronary Heart Disease (An Overdue Requiem for Palliative Cardiology). Article on Caldwell Esselstyn’s website. In 1990, physician and health economist Christopher Murray at Harvard University and medical demographer Alan Lopez at the World Health Organisation embarked on the first ever attempt to measure the global burden of disease and developed the now-famous Disability Adjusted Life Year (DALY) metric that made it possible to combine estimates of mortality and morbidity burden around the world. DALY is the sum of years lived with disability [YLD] and years of life lost [YLL]. Since then, there have been estimates in 1999 to 2002 and 2004. But the latest iteration of the project, Global Burden of Disease 2010, has been on a different scale, involving nearly 500 researchers from more than 300 institutions in 50 countries. It is the largest ever systematic effort to describe the global distribution and causes of a wide array of major diseases, injuries, and health risk factors. Twenty years ago, the project assessed the burden of 107 diseases and injuries and ten selected risk factors for the world and eight major regions over one calendar year. Now, thanks to advances in technology, the availability of data, and the participation of experts around the world, as well as the leadership of a core group of researchers, the scope has increased to 291 diseases and injuries in 21 regions, for 20 age groups, and an estimation of trends from 1990 to 2010. Global Burden of Disease 2010 also includes an assessment of 67 risk factors. The results, published yesterday in seven articles in The Lancet, are set to shake up health priorities across the world. In summary, the analysis shows that infectious diseases, maternal and child illness, and malnutrition now cause fewer deaths and less illness than they did twenty years ago. As a result, fewer children are dying every year, but more young and middle-aged adults are dying and suffering from disease and injury, as non-communicable diseases, such as cancer and heart disease, become the dominant causes of death and disability worldwide. Since 1970, men and women worldwide have gained slightly more than ten years of life expectancy overall, but they spend more years living with injury and illness. There were 52.8 million deaths in 2010 compared with 46.5 million deaths in 1990. Of these, 12.9 million were from ischaemic heart disease and stroke, or one in four deaths worldwide, compared with one in five in 1990. Cancer claimed 8 million lives in 2010 compared with 5.8 million in 1990; trachea, bronchus and lung cancer accounted for 20% of these. Twice as many people died of diabetes in 2010 – 1.3. million – than in 1990, which is higher than deaths from tuberculosis or malaria (1.2 million each). Deaths from HIV/AIDS increased from 0.30 million in 1990 to 1.5 million in 2010, reaching a peak of 1.7 million in 2006. The fraction of global deaths due to injuries (5.1 million deaths) was marginally higher in 2010 (9.6%) compared with two decades earlier (8.8%). This was driven by a 46% rise in deaths worldwide due to road traffic accidents (1.3 million in 2010) and a rise in deaths from falls. The contributions of risk factors to regional and global burden of diseases and injuries has shifted substantially between 1990 and 2010, from risk factors that mainly cause communicable diseases in children to risk factors that mainly cause non-communicable diseases in adults. The proportion of overall disease burden attributable to childhood underweight – the leading risk factor worldwide in 1990 – had more than halved by 2010, making childhood underweight the eighth risk worldwide, behind six behavioural and physiological risks, and household air pollution from solid fuels. Other risks for child mortality, such as non-exclusive and discontinued breastfeeding, micronutrient deficiencies, and unimproved water and sanitation, have also fallen. However, child and maternal undernutrition risks collectively still account for almost 7% of disease burden in 2010, with unimproved water and sanitation accounting for almost 1%. Of the non-communicable disease risks, high blood pressure, high body-mass index, high fasting plasma glucose, alcohol use, and dietary risks have increased in relative importance. This overall shift has arisen from a combination of the ageing population, substantial achievements in lowering mortality of children aged younger than 5 years, and changes in risk factor exposure. These broad global patterns mask enormous regional variation in risks to health. In sub-Saharan Africa, risks such as childhood underweight, household air pollution from solid fuels, and suboptimal breastfeeding continue to cause a disproportionate amount of health burden, despite decreasing. The shift to risk factors for non-communicable disease was clear in east Asia, North Africa and Middle East, and Latin America. For people aged 15 to 49 years, the leading risk factor worldwide was alcohol use, followed by tobacco smoking including second-hand smoke, high blood pressure, high body-mass index, diet low in fruits, drug use, and occupational risk factors for injuries. Risk factor rankings in this age group stayed broadly similar between 1990, and 2010, with the exception of iron deficiency, which dropped from the fourth leading risk factor in 1990, to ninth in 2010. High blood pressure, tobacco smoking including second-hand smoke, alcohol use, and diet low in fruits were all in the top five risk factors for adults aged 50 to 69 years and adults older than 70 years, in both 1990, and 2010, accounting for a large proportion of disease burden in both age groups. Globally, high blood pressure accounted for more than 20% of all health loss in adults aged 70 years and older in 2010, and around 15% in those aged 50 to 69 years. Tobacco smoking including second-hand smoke accounted for more than 10% of global disease burden in each of these age groups in 2010. Globally, the sum of years lived with disability and years of life lost (DALY), was influenced most by dietary risk factors and physical inactivity – together these were responsible for 10% of the global disease burden in 2010. Of the individual dietary risk factors, the largest attributable burden in 2010 was associated with diets low in fruits (4.9 million deaths), followed by diets high in sodium (4.0 million deaths), low in nuts and seeds (2.5 million deaths), low in whole grains (1.7 million), low in vegetables (1.8 million deaths), and low in seafood omega-3 fatty acids (1.4 million deaths). Physical inactivity and low physical activity accounted for 3.2 million deaths. This impressive analysis of global health issues by Christopher Murray and colleagues provides much reason for hope but also challenges the current medical paradigm and global healthcare system. It shows clearly that the focus of global health authorities in recent decades on reducing infection and malnutrition has paid off – life expectancy has increased almost everywhere. This focus needs to continue to minimise incidence of diseases like tuberculosis, malaria and HIV/AIDs. It also reveals, however, that the leading causes of death in the modern developed world are conditions which cannot be controlled by vaccinations, antibiotics, improved sanitation or insecticides. The data provide evidence that the risk factors for non-communicable diseases like heart disease, cancer and diabetes, are predominantly related to poor diet and lifestyle. The large attributable burden for dietary risk factors such as diets low in fruits, vegetables, whole grains, nuts and seeds, and seafood omega-3 fatty acids might come as a surprise to some. The large burden is caused by both high exposure, e.g., low intake of fruits and vegetables in many regions – and large effect sizes. Given the crucial role of dietary and lifestyle factors in determining long-term health, the answer to alleviating the suffering created by these chronic non-communicable diseases does not lie in the current medical model, with its preoccupation with drugs and surgery. Our doctors are trained to relieve symptoms not to address the underlying causes of chronic disease. Powerful commercial interests in the food, pharmaceutical and health sectors drown out the voices of those who can see that the solution is really very simple. Widespread consumption of plant-based diets, rich in vegetables, fruit, whole grains, beans, nuts and seeds, together with not smoking and more physical activity, would transform people’s lives and radically reduce healthcare costs. It is not rocket science. Dr Murray, I salute you and your colleagues for a first rate piece of work. May the truths you have exposed become part of mainstream understanding as quickly as possible and lead to a sea change in our approach to health and well-being. Murray et al (2012). Global Burden of Disease 2010. The Lancet, 13 December 2012. Can we discover the fountain of youth? 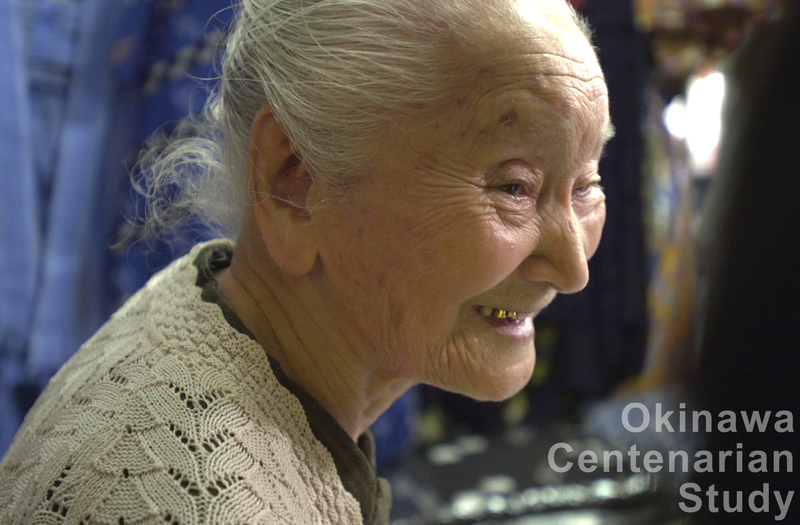 Some answers lie with the healthiest people on earth – the elders of Okinawa in Japan. Okinawa has a higher proportion of centenarians than anywhere on the planet – more than four times that of the UK. Not only this, but they remain healthy and active into advanced old age. Compared with people of the same age in the UK, Okinawan elders have an 80 per cent lower risk of heart disease, stroke, breast and prostate cancer, a 50 per cent lower risk of other cancers, including colon, ovarian and lymphoma, a 50 per cent lower rate of hip fracture, and a 30 to 40 per cent lower incidence of dementia. So what are their secrets? Secret #1 is maintain a positive, optimistic attitude. Okinawans believe that everything in life works itself out in the long run. With this attitude, there is no need to worry. They intentionally live a calm, peaceful life with little stress. When they work, it is at their own pace, rather than putting pressure on themselves to get things done in a hurry. Experts believe this relaxed way of being is vital for health. Secret #2 is cultivate strong relationships. Okinawans often meet with friends and family just to chat, laugh or offer support to one another. Endless studies have shown that people are healthier when they have good relationships and an active, positive social life. Secret #3 is eat a very healthy diet. It is considered especially important that the traditional Okinawa diet is both simple and wholesome. It consists mainly of plant food – whole grains, beans, vegetables, fruit, nuts and seeds – that are high in vitamins, minerals and phytonutrients, and fish that is rich in protein and omega-3 oils. They also eat less food than the average in countries such as the UK and USA and have a cultural tradition called hara hachi bu, which means eat until 80 per cent full. Eating a natural unprocessed diet, low in sugar, saturated fat and salt, greatly reduces their risk of health problems related to overweight and obesity. Secret # 4 is lead an active life. Most Okinawans are physically active. They walk everywhere, work in their gardens, dance and practice traditional martial arts like tai chi. For more information about the effect of diet on health, plant-based diets, recipes and tips please sign up for my free newsletter and visit my website. Fierce controversy rages in the popular press about carbohydrates and their influence on our health. Thanks to the popularity of the Atkins, South Beach and other low-carbohydrate diets, many believe that all carbohydrates are “bad” and a cause of the obesity epidemic. Like many issues associated with nutrition, this is a dangerous over-simplification, rather like the “all fat is bad” message. We now know that carbohydrates, the staple of most diets, are neither all good nor all bad. Some kinds of carbohydrates promote health whilst others, when eaten often and in large quantities, actually increase the risk for obesity, diabetes, coronary heart disease and some cancers. Easily digested carbohydrates from white bread, white rice, white pasta, biscuits, cakes, pastries, sugary drinks and other highly processed foods may indeed contribute to weight gain and interfere with weight loss. Whole grains, beans, fruits, vegetables and other sources of intact carbohydrates do just the opposite – they promote good health. Blanket dismissal of carbohydrates is thus misleading as they are an important part of a healthy diet. Carbohydrates provide the body with the fuel it needs for physical activity and for proper organ function. The brain, for example, is totally reliant on carbohydrates to power its activity – 40 per cent of the carbohydrates we consume are used to provide glucose for the brain. The best sources of carbohydrates – fruits, vegetables and whole grains – also deliver essential vitamins and minerals, fibre and a rich array of protective phytonutrients. 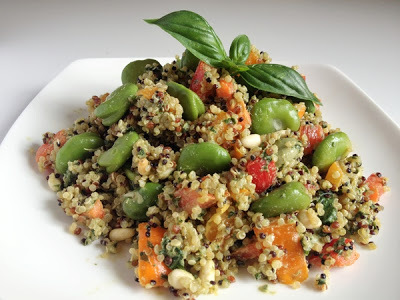 For optimal health, obtain your grains intact from foods such as whole wheat bread, brown rice, whole grain pasta, and other possibly unfamiliar grains like quinoa, whole oats, millet, buckwheat and bulgur. Start the day with whole grains. If you like hot cereals, try porridge made from whole oats, quinoa or brown rice. If you are a cold cereal person, look for muesli or one that lists whole wheat, whole oats, or other whole grain first on the ingredient list. Have fresh or dried fruit with your cereal. Use whole grain breads or crackers for lunch or snacks. Check the label to make sure that whole wheat or another whole grain is the first ingredient listed. Oatcakes with hummus (made from chickpeas) are an excellent ‘good carb’ snack. Reduce intake of potatoes. 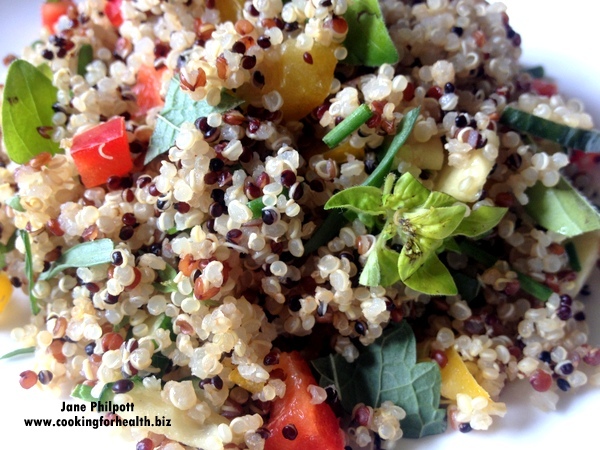 Instead, try brown rice or even “newer” grains like quinoa, millet, buckwheat or barley with your dinner. There is nothing wrong with potatoes per se – my message is about increasing the variety of starches in your diet, as each grain contains a wide array of nutrients and phytonutrients beneficial for health. Exchange ‘white’ foods for ‘brown’ foods. Brown rice usually needs to be cooked for longer than white rice. If the whole grain products are too chewy for you, look for those that are made with half whole-wheat flour and half white flour. 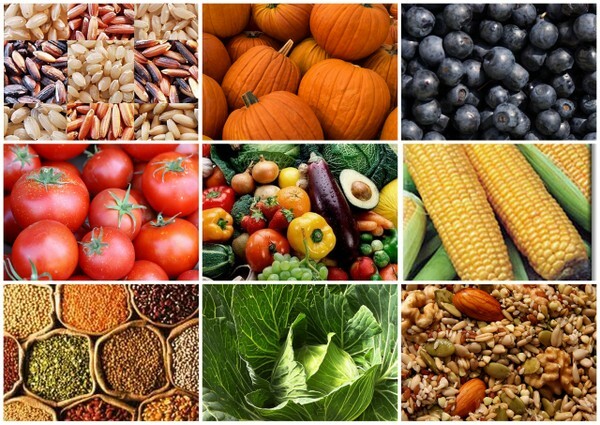 Beans, nuts, seeds, fruit, vegetables. Beans are an excellent source of slowly digested carbohydrates as well as a great source of protein. Try adding them to casseroles and soups. Aim to eat 5 to 10 portions of vegetables and fruit per day. Accumulating evidence for the role of metabolic disorders such as insulin resistance, diabetes, obesity and hypertension in increasing the risk of Alzheimer’s disease and vascular dementia, is reviewed in a new paper published this month in the Archives of Neurology. In the same journal, compelling evidence is presented that higher pre-diagnosis total cholesterol, low-density lipoprotein cholesterol, and diabetes are associated with faster cognitive decline in patients with incident Alzheimer’s disease. A cohort of 156 patients with incident Alzheimer’s Disease (mean age 83 years) were followed for up to 10 years. Changes in a composite score of cognitive ability were monitored from diagnosis onwards. said Yaakov Stern, Ph.D., a professor at the Taub Institute for the Research on Alzheimer’s Disease and the Aging Brain and director of the Cognitive Neuroscience Division of the Gertrude H. Sergievsky Center at Columbia University Medical Center, and senior author of the paper. “Preventing heart disease, stroke and diabetes – or making sure these conditions are well managed in patients diagnosed with them – can potentially slow the disease progression of Alzheimer’s,” said Dr. Stern. Diets high in fruit, vegetables, fibre and unsaturated fats, and low in sugar, salt and saturated fat are known to reduce the risk of a range of chronic conditions, such as diabetes, heart disease and stroke. This means eating more plant-based foods and less processed and animal-based foods. Stabilising blood sugar is crucial. This may be done by eating a diet with a low glycaemic load, that is, one that includes moderate quantities of complex carbohydrates which release glucose slowly into the bloodstream. Whole grains, such as whole-wheat bread, brown rice, quinoa, millet and buckwheat are valuable for helping to ensure smooth regulation of blood sugar. 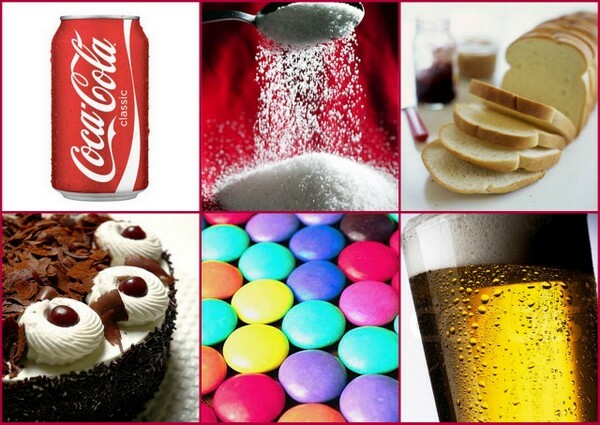 In contrast, highly refined carbohydrates, such as white bread, white rice, white pasta and table sugar, create a roller-coaster of blood sugar highs and lows, which if left unchecked, can ultimately give rise to insulin resistance and eventually to diabetes. Potatoes release sugar into the bloodstream almost as fast as table sugar and thus should be eaten sparingly, unless you are lean and exercise regularly. Consuming protein with carbohydrates at every meal has also been found to help regulation of blood sugar. Increasing the quantity of vegetables and fruit in the diet is also vital. Blood sugar levels are easier to maintain if vegetables are emphasized more than fruit, as some fruit contains a lot of sugar. A minimum of 5 portions of fruit and vegetables per day is recommended. For easy tips for increasing the amount of fruit and vegetables in your diet please click here. Unsaturated fats found in plant oils, such as olive oil and the oils of nuts and seeds, and in oily fish, are beneficial for preventing heart disease and other vascular health conditions. For practical suggestions for ways to incorporate more healthy unsaturated fats in your diet please click here. For information and practical tuition in how to put all these recommendations together to create fabulous food that protects you from diabetes, heart disease and Alzheimer’s Disease, please come to a Cooking for Health course, run by nutrition expert, Dr Jane Philpott.